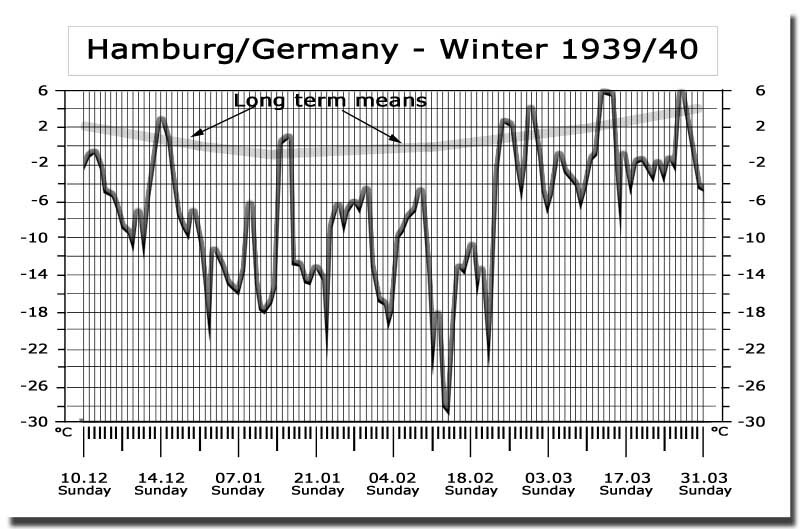 The winter of 1939/40 does not only cover the first six months of a six year-long murderous war but it also marks the first very pronounced climatic shift into a cooling trend since the end of the Little Ice Age. The shift did not come as a gradual change from warming to cooling, but temperatures over Europe fell on the continent like with the force of a sledgehammer. 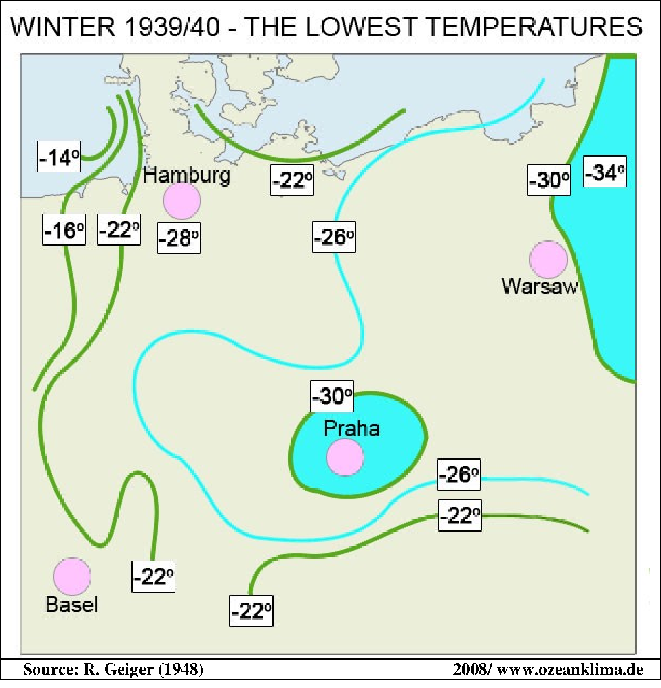 In many regions and locations it was the coldest winter since the 1820s. The book will dedicate most of its elaboration to this winter because a bunch of madmen, acting as the government of the Third German Reich made this all happen. 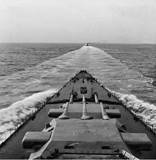 one mentioned how foolish it would be to start with naval war activities in northern European waters in early autumn. It would release the heat stored in the North Sea and Baltic earlier than in other years. This heat is an essential contributor to moderate winters in Europe . No, Reichskanzler Adolf Hitler and the High Command of the Wehrmacht had no idea of the risks, neither did their professional advisers. The personal responsibility, for weather and climate modification in the winter 1939/40 and beyond, was never raised. That should come as a surprise in the light of the current discussion on climate change. H. Göring, the chief of the aviation, air force, and weather services was mistaken. 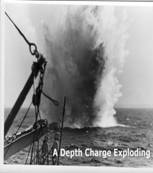 The winter severity was man-made, not necessarily alone, but the war contributed substantially to the harsh conditions. 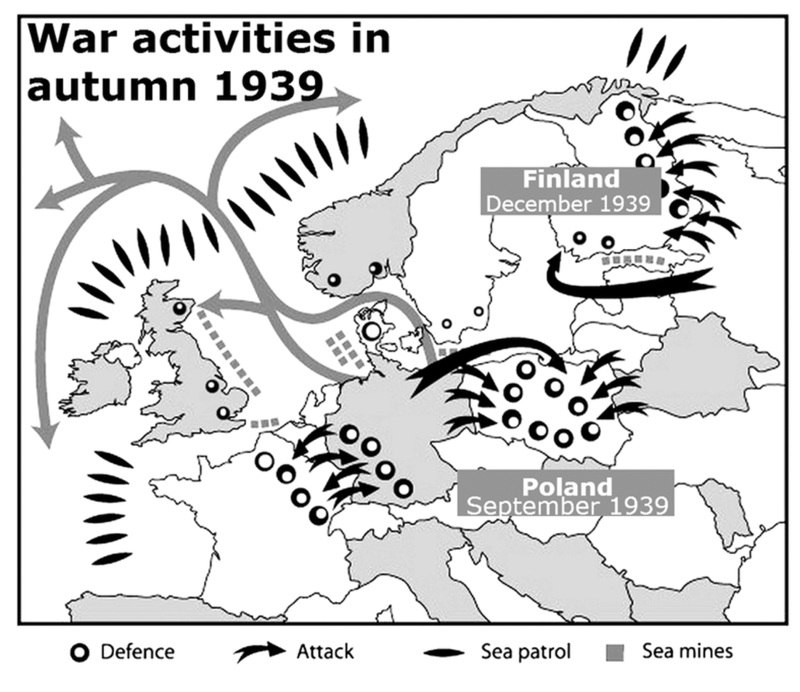 Without naval war during the autumn of 1939 the subsequent winter would not have turned out as cold as in the severest winters during the Little Ice Age. 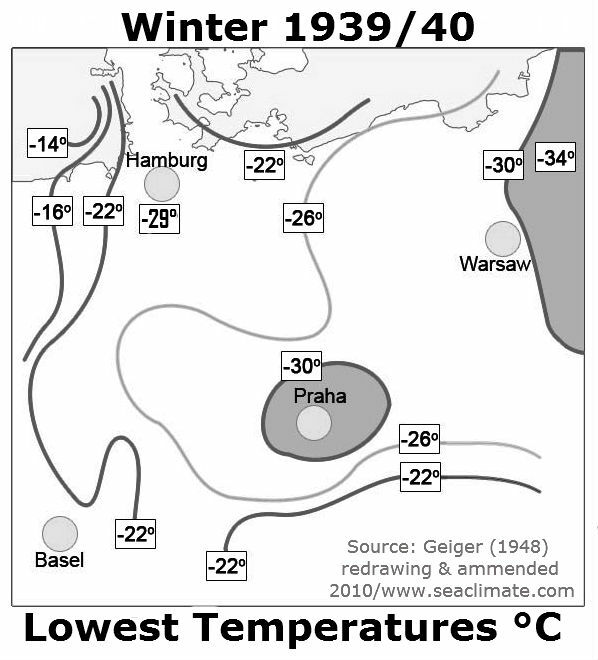 After record conditions in January 1940 (see TM4, next page), many locations in Europe faced extreme temperatures in February again, reported by New York Times (NYT, Feb. 14-16), for example: Copenhagen –25°F/-32°C, Baltic countries –54°F/-48°C, Budapest –28°F/–33°C, and the NYT titled a report on February 21st: “Scandinavia is colder. Sweden suffers 32° below zero (Fahrenheit), worst since 1805”. 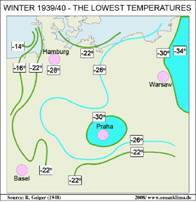 In northern Germany several all-time cold records were registered, e.g. in Hamburg –29.1°C/-21°F on February 13th. 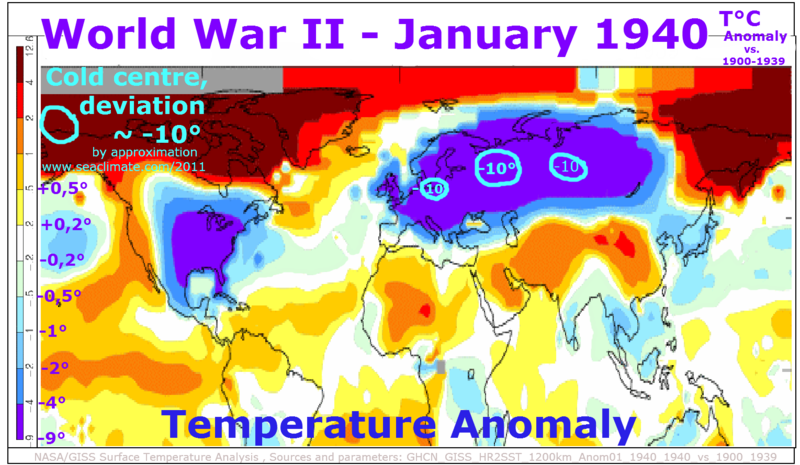 In Moscow January 1940 was the coldest ever recorded, and the entire year 1940 as well (wikipedia/climate). That is something to take note of. Fig. 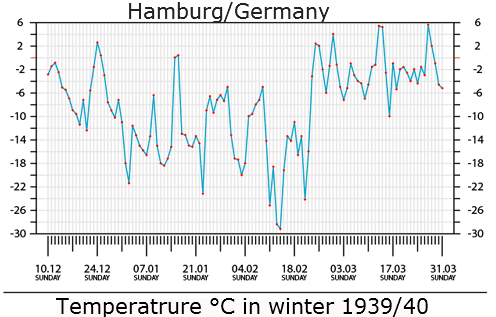 C1-5; Hamburg, Dec. 051939 to Feb. 29 1940, with all time lowest -29°C on 13 Feb.1940. After only six months into war the result justifies calling the German leadership not only irresponsible, but by today’s standards, environmental criminals. Within six months they had turned the European winter weather up-side-down. “The widespread tendency towards mild winters seemed to have gone for ever”; bemoaned the already mentioned scientist from the Kew Observatory only a short time later (Drummond, 1943). February was followed by a very cold March, and at the end of the year, at least for Central Europe, e.g. 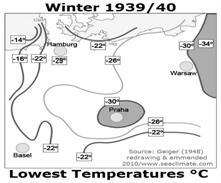 Germany, Poland, Czechoslovakia, Hungary, it was not only the most severe winter for more than a 100 years, but the entire year 1940 became the coldest of the 20th century. The whole matter should have been a shock to political leaders and meteorological services around the world, but not even the smallest raise of an eyebrow could be observed. At latest by the end of February 1940, it was possible to realize that the harsh winter conditions did not have come out of the blue, but had something to do with the war machinery in action. 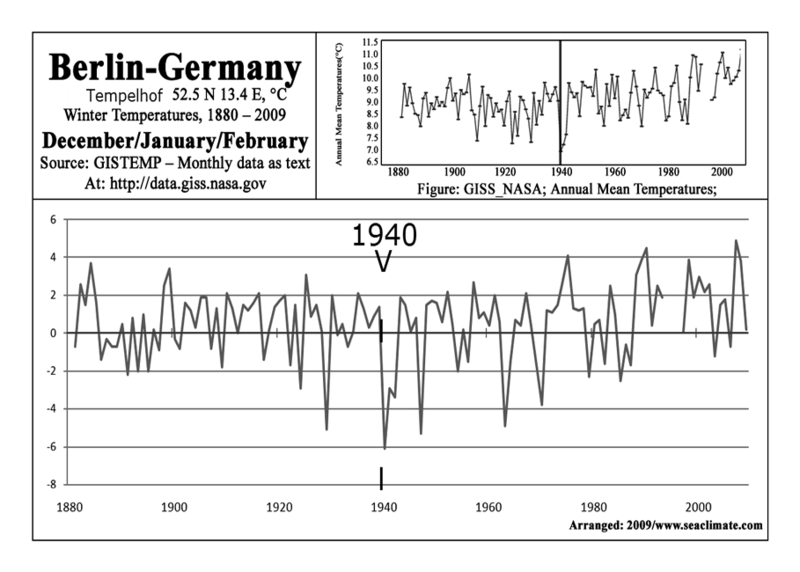 After 80 years with mild winters (Rodewald, 1948), the trend was stopped by surprising abruptness. 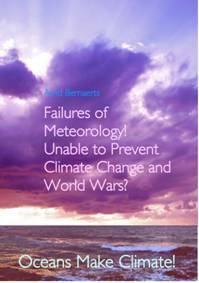 From now on it was possible to realize that naval warfare had pushed the sea areas in the realm of the European continent into conditions that prevented them to supply the atmosphere with the heat as it used to do during peacetime. 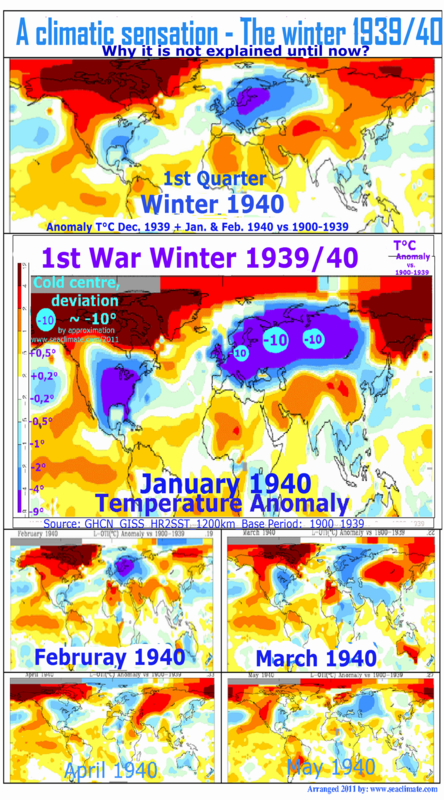 But nothing happened to understand and explain the conditions and the story of the making of extreme winter weather over the first six months into WWII, neither in spring 1940, nor when also the next two war winters ran amok, and not even after WWII had ended. 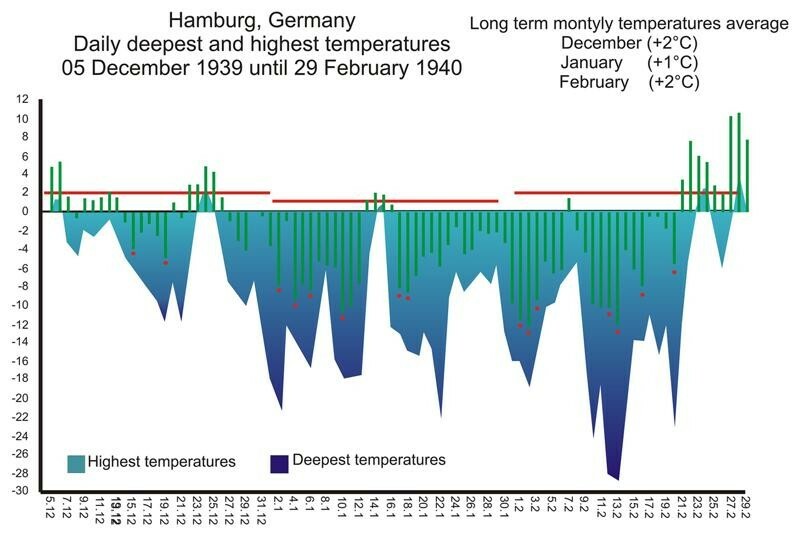 Meanwhile 70 years have passed and science still does not know why the winter 1939/40 was the coldest for more than a century in parts of Northern Europe . That is very difficult to understand. For climate research the first war winter offered a unique chance to study climatic changes, and anthropogenic relevance. In a flippant way one could say: “Bingo”. There is no question that the cruelty man did to man during the war was pure horror and extremely sad. But if the war is called a unique opportunity, the situation is different, namely man versus nature. Seeing it this way the entire situation, as it was so many decades ago, could be used as a worst scenario for a good cause, by regarding the first six months of naval war as a large-scale field-experiment with climate. · Nature has been warming since the end of the Little Ice Age. · No unusual event, e.g. sun spots, volcano, tsunami, had been observed. · No one had expected a sudden arrival of an extreme winter. · During the first months at war man’s activities took place in a natural environment, in the sense that data records and series had not been altered by an anthropogenic impact. This is an aspect one cannot be sure of, concerning the amount of data collected the longer the war lasted. · During the first few months any war and naval activities could to some limited extent be viewed individually, which seems widely impossible the more war activities increased, spread, intensified, and lasted. o The experiment is undertaken during the winter season, when the direct influence of the sun between France , Switzerland , Bulgaria , and the North Cape is low. During the winter season a considerable part of the heating of Northern Europe is provided by the ocean and surrounding regional seas. 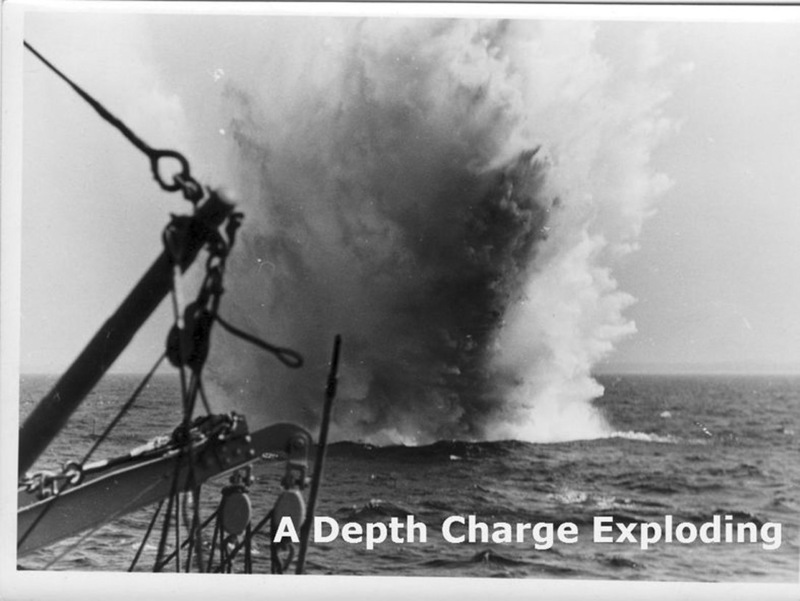 · It is furthermore to be noted that the naval war during the first war months was not limited to the North Sea and Baltic, but reached far out into the North Atlantic and up to the Barents Sea . That was modest, compared to events that occurred only a couple of months later, but can and should not be ignored in the entire picture. The confinement of the investigation to the winter season is the key to detect the cause of the extreme winter weather 1939/40, namely, naval warfare in the marine environment. Hermann Göring was a celebrated WWI air fighter pilot who joined the Nazi movement as early as 1923, and in 1933 became secretary of aviation. He became also the head of the weather services, e.g. the “Seewarte” in Hamburg , which provided services to the navy. In 1938 he became head of Germany 's armed forces. The following year he became Hitler's deputy and legal heir. During WWII Göring was in charge of the Luftwaffe (air force). In 1946 he was found guilty at the Nuremberg War Crimes Trail.